The Ionian Islands are known collectively as the 'seven' islands and are located in the Ionian Sea, on the west coast of Greece. The seven Ionian Islands are Corfu, Kefalonia, Zakynthos, Lefkada, Ithaki, Paxos and Kythira. Zakynthos, with a population of 38,680 inhabitants, is the third largest of the islands. Zante as it is widely known, also includes the uninhabited islands of Strofades, Marathonisi, Peluso and other small islands around the coastline. Administratively, the island consists of the Municipality of Zakynthos. The municipality is divided into 6 districts: Zakynthos, Laganas, Elation, Artemision, Arkadion and Alykon. The capital city of the island is Hora or Zakynthos Town. The district of Alykes is situated on the north-eastern side bordering the districts of Elation, Artemison and Arkadion. Alykes took its name from the famous historical salt flats called "Alykes" where up until a few years ago was a large production site for salt. The main area of the district is Katastari, a small town and also the largest village in Zakynthos. The population of Alykes was recorded at around 4,800 residents at the last census in 2001. The main tourist area is on the coast of Alykes and the area also benefits from significant agriculture with main crops of olives, grapes, vegetables and livestock. 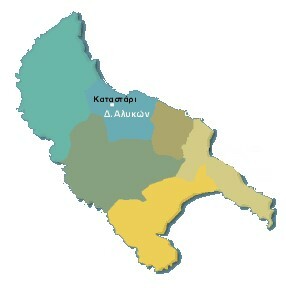 The distirct of Alkes is divided into 9 regions: Katastari, Agios Dimitrios, Alykanas, Kallithea, Skoulikado, Kato Gerakaro, Ano Gerakario, Meso Gerakario and Pigadakia. Each local region has its own councelors which are elected every four years and under the management of the Mayor.